Having kids means that your home will become consumed with toys. Especially when they are young and not centered around technology only. What better way to store and keep your home neat and tidy than with a gorgeous wooden toy box? Welcome to the WoodToyBox.com giveaway! 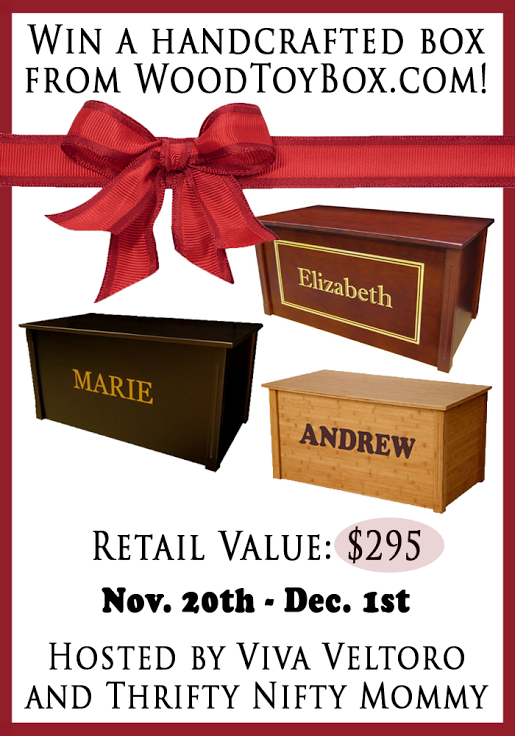 These gorgeous toy boxes are sold for $295, and a custom box is being offered to one lucky winner! WoodToyBox.com handcrafts their toy boxes and blanket chests in Bismark, North Dakota as a family owned business. They have designed their chests as "ready to assemble" kits that can be shipped (FREE SHIPPING!) to all over the world. They have produced over 10,000 boxes and chests, all built to last a lifetime! These toy boxes are made from 100% all-wood construction; instead of portions of particle board or flimsy interior pieces, beautiful solid oak is used for the corner pieces. You also have the option of ordering your box with a cedar base, making it a great option for storing blankets, while also deterring insects. Use it for toys when they are young then storage when they are older! The toy box provides a lot of room for storage; the outside dimensions of the toy box are 41"L x 21"W x 20"H. All finished products are lead free and completely safe for children. Lid supports are installed so that the lid will stay in place at any angle and will not drop on fingers because of a space where the lid meets the box. The boxes from WoodToyBox.com are especially unique because they can be personalized with laser-engraved writing. WoodToyBox.com has an unlimited library of designs and fonts that you could use to personalize your box. There are beautiful borders, thematic lettering, maple letters, animal critters, etc. Test the DESIGN YOUR TOY BOX option (in the middle of the page) and see what beautiful heirlooms you could create! Try it out! Camille, from Viva Veltoro, recently had the opportunity to review an Espresso Handcrafted Toy Chest, and she was smitten with the quality, the construction, and the appearance of the box in her home, especially with the custom "Merry Christmas!" writing on the inside of the lid! Check out the full review to see how easy these boxes are to assemble, and how much they actually hold! You can purchase a handcrafted toy box on their website and customize it just to your liking! They offer a 100% satisfaction guarantee and you can enjoy FREE SHIPPING on all boxes! WoodToyBox.com is offering one winner the opportunity to design their own custom toy box! Open to the US only, ages 18 and up. Ends 12/1/14 at 11:59 PM EST. Disclosure: This giveaway is hosted by Viva Veltoro and generously sponsored by WoodToyBox.com. Viva Veltoro, Thrifty Nifty Mommy, and the participating blogs are not responsible for prize fulfillment. Please contact vivaveltoro(at)gmail.com with questions about this giveaway. One winner will be randomly selected using the Giveaway Tools random selector and notified via email. Once notified, the winner will have 48 hours to respond or a new winner will be chosen. This giveaway is in no way associated with Facebook, Twitter, Instagram, Pinterest or Google. Void where prohibited. I would customize this with my son's name! I would get it customized with our last name for our girls! I love that there are different fonts available!